Many books have been written about inward prayer, or meditation, but Joel Goldsmith's classic, The Art of Meditation, presents meditation not as a theory, but as a joyous and rewarding experience. The book begins with these words: "Most men and women are convinced that there is a divine Power of some sort operating in human affairs, but they are not sure what it is, nor do they know how to bring this divine Presence and Power into daily experience." 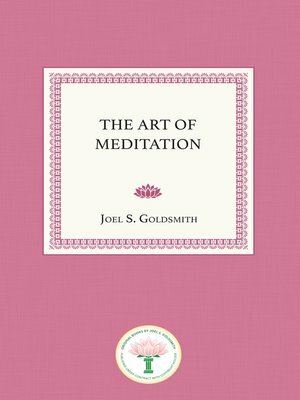 In The Art of Meditation, Goldsmith shows the reader the way, and it is through meditation. Goldsmith says that on the whole, the world has no knowledge of God as the living Power and Presence with Whom we are one. If it did, its anguish, wars, sin, and death would vanish. But, he says, individuals can learn the nature of God and how to contact God. He writes: "Christ buried in the tomb of the mind will not come forth and do works, but Christ risen in our consciousness, Christ raised from the tomb through meditation and communion – that is the miracle worker of the ages." The Art of Meditation explains how this inner Presence, also called "the Christ," can be realized and can operate in daily life. While many people pray for the purpose of getting something, Goldsmith explains that we should enter meditation without ulterior motive: "Any meditation that has within itself a single trace of a desire to get something from God or to acquire something through God is no longer meditation." He presents meditation as a turning within and listening. At some moment in that quietude, when human thought is stilled and the noise of human living is hushed, the God-experience comes in. The Art of Meditation gives the reader careful instructions about how to undertake the beautiful spiritual practice of daily meditation. Goldsmith says that the purpose of this book is "to help students practice the art of meditation by which the Word takes root, so that they come into an actual awareness, an actual consciousness of living in the Spirit." The object is to reach the state of consciousness revealed by Paul: "I live yet not I, Christ liveth my life." Then God appears as the wholeness, the abundance, the harmony, the peace, and the joy of our experience.